Red Mountain, Colorado by Carol Highsmith. 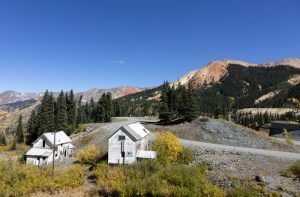 Located between Silverton and Ouray along the “Million Dollar Highway” in southwest Colorado, is the Red Mountain Mining District, which was the site of a historic silver boom from 1882 until 1893. In the beginning, only low-grade discoveries were made in the first few years of mining activity. However, valuable columns of silver ore called “pipes” were discovered in and mining quickly began. 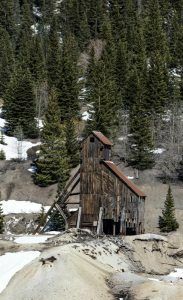 When John Robinson discovered the fabulously rich Yankee Girl Mine in 1882, the rush was on to Colorado’s newest mining district. Newspapers spread the word on the east coast of the valuable ore coming out of the district, peaking the interest of numerous investors. After silver strikes were made at the Guston, Congress, and the National Belle mines, Eastern capitalists began sending money into the district, leading to the rapid industrialization of the area. By 1883, nearly 40 mines were sending silver ore to smelters. The nearby towns of Silverton and Ouray fought to become known as the entry point into the district, with each touting that it was the only way into the area and warning of the dangers that faced by those who came from the other direction. The two towns were almost an equal distance from the new discoveries and better transportation was badly needed to bring the rich ore out to market. 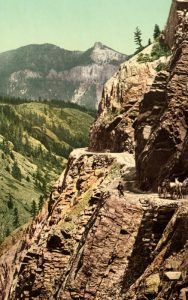 In 1880, a road began to built from Ouray across the steep “impassable” cliffs to Red Mountain Pass by the Ouray and San Juan Wagon Road Company. Though progress was made in the first two years, the company was running out of money by 1882. After several attempts to reorganize, and refinance, Otto Mears offered to purchase a 54% interest in the toll road company. After putting a larger and more experienced construction crew to work, Mears completed the road in 1883. This road would eventually become known as the famous Million Dollar Highway. In the meantime, a number of towns were established in an area less than eight square miles. These included Albany, Chattanooga, Red Mountain Town (aka Rogersville), Guston, Congress (aka Red Mountain City), and Ironton. Into these mining camps came prospectors, miners, cooks, freighters, prostitutes, gamblers, saloon keepers, boarding house operators, and families increasing the district’s population to more than 3,000 people. 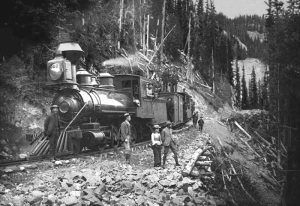 The Silverton Railroad began to be built from Silverton to the Red Mountain District by Otto Mears in 1887. The next year, the line reached Ironton in November. It was completed in September 1889 to its terminus in Albany. The railroad connected the district’s towns to the bustling city of Silverton and allowed the mines to ship medium and low-grade ore to smelters in Durango and Pueblo. Also traveling on the train were the rich Eastern and European investors, who were brought directly to the mines in luxurious coaches. The short 18-mile narrow gauge railroad was nicknamed “The Rainbow Route” because it arched across the steep Red Mountain Divide like a rainbow in the sky. It was described by its Chief Engineer, Charles W. Gibbs as “the steepest, the crookedest, and the best paying road (railroad) in Colorado.”The railroad had four wyes, a switchback with a covered turntable, a 200-degree loop, and an average grade of 5% over the 11,113 summit of Red Mountain Pass. The arrival of the railroad was a critical transportation event during this period, dramatically lowering the costs of mining and living, increasing tonnages of ore that companies could ship, providing a direct link with the Durango Smelter, making a wider variety of goods available at lower prices, and improving the overall quality of life. The railroad was a principal-agent that allowed the mining industry to boom. Life in these high mountain mining camps were tough for the people living there. Deadly avalanches were common and snows were so heavy that work came to a halt and the ore couldn’t be shipped out. Nighttime temperatures dipped to 20-30 degrees below zero. Water, when mixed with the local pyrites formed sulfuric acid which ate at the pumps, mine rails, shovels, and mining machinery, often rusting the metal within a month’s time. People died in mining accidents, snow slides or by gunshot wounds. However, very few died of sickness due to the pure water and cold temperatures that contained many potential illnesses that would have flourished elsewhere. There were reportedly only four people over a 20-year span who died from sickness. After the Silver Panic of 1893, the district dramatically declined. The Silverton Railroad cut back service, shortened the line, and then was abandoned in 1921. Idarado Gold Mine, Colorado by Carol Highsmith. After the district’s heyday, there was some gold discovered at the Joker and Meldrum tunnels, but the ore lost value the deeper the miners went and these ventures also eventually closed. Mining revived during the first and second world wars. In the 1930s the Idarado Mine opened and it continued to operate until 1978. It is estimated that upwards of 30 million dollars in silver, lead, zinc, copper, and gold were taken from the Red Mountain Mining District in a few short decades. At today’s prices that production would be well over a quarter of a billion dollars today. Over the years, many of the structures of the district fell into disrepair or were salvaged. 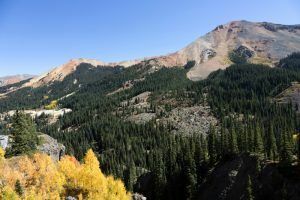 In 1998, the Red Mountain Project was launched in an effort to preserve threatened historic landscapes and structures along the San Juan Skyway and in and around Red Mountain Pass. After years of effort, the Red Mountain Task Force partnered with several organizations and private citizens to purchase over 8500 acres of historic landscapes. The project protects and stabilizes the district, installed interpretive signs, and constructed miles of hiking trails to provide public access to this once endangered site. Little remains of the towns that once prospered in the district but, about 50 structures still stand in the area. The outline of the railroad grade is only faintly visible. Some of the district is privately owned and not open to the public, partly due to dangerous structures and open shafts, and also due to ongoing environmental clean-up. Many of the structures can be seen from the roadside. For those with a 4-wheel drive, high clearance vehicle, the district can be further explored. The district can be accessed from Highway 550 from the north on Ouray County Road 31, ten miles south of Ouray. Another portion of the district can be accessed six miles northwest of Silverton, along Forest Road 825. Today, Red Mountain Pass and its surrounding lands are one of Colorado’s great tourist attractions. Ironton, Colorado ghost town by Carol Highsmith.